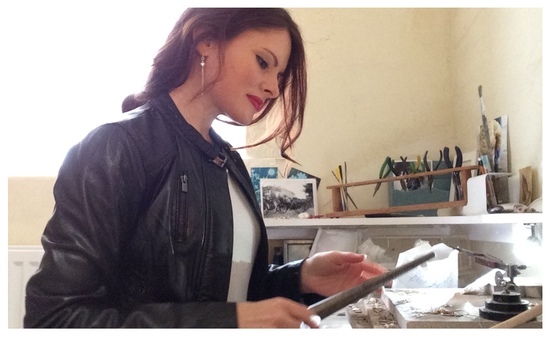 Milly Moore makes striking and elegant original jewellery in silver and gold. Her popular Dedication Collection, featured here on notonthehighstreet.com, has been a bestseller for eighteen years. Worn by mothers, fathers, and grandmothers to keep their loved ones close to their heart at all times. Her jewellery is often given at weddings, Christenings, anniversaries and other special occasions to mark life's poignant events. The words 'cherish, celebrate, remember' capture the essence of the collection. Each piece is handmade by Milly in her courtyard studio for you to wear forever, then pass on to future generations. Her background as a fine artist combined with ten years as a silversmith result in finely crafted and balanced jewellery compositions that have symbolic significance. She is a member of the prestigious Crafts Council Register of Makers as well as Design Factory and her gallery collections have been widely exhibited and collected across the UK. Her jewellery was featured in the May 2010 issue of VOGUE magazine. Milly uses only the finest precious metals, lustrous pearls and vibrant gemstones sourced from across the globe. She enjoys working to commission to create one-off pieces so if you have something special in mind you would like to discuss, please contact her via the 'ask seller a question' button. She would love to hear from you!